Do you have a fun story or a golden memory you'd like to share? Email me the story with a picture. Growing up in the Rocky Mountains with my dad and brothers gave me countless opportunities to enjoy fishing high mountain lakes, big game hunting, hiking the Wind Rivers and listening to embellished stories of Ole’ Ephraim, a grizzly bear that wrecked havoc on the local sheep herders in the early 1900’s. Cache Valley was explored by Jim Bridger and was used as a “Caching” and rendezvous location for the mountain men who roamed the area. Today, it’s certainly not a place one thinks of when upland bird hunting. I don’t have any amazing stories of blacken skies filled with fluttering pheasant wings like the Dakota’s, but the west offers many opportunities to hunt quail, grouse, chukars and best of all, pheasants. Cache Valley is no exception offering fun hunts for those who don’t mind the thick bull rush or hiking the foothills. For several years now, I’ve been hunting my golden retrievers with my brother-in-laws or work buddies who, of course hunt labs or Germans. 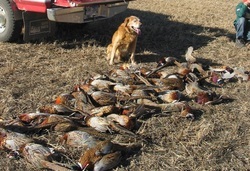 At first, I’d get funny looks like, “Can goldens really hunt?” but that’s all changed over time, especially during last fall’s hunt. On a crisp fall Saturday morning after a mild rainstorm in September 2011 my good buddy Paul and I decided to take our sons out to Newton, a small farming town located on the western foothills of Cache Valley. The regular noise of guns being loaded and anxious dogs filled the air as we studied the terrain and devised a plan. Seven of us spread out creating a hunting line as we worked up the foothills towards a stand of mountain maples. Once we reached the top, we planned to turn north and hunt down a long ravine towards an old farm road. It wasn’t long before six year old Sheila and 22 month old Bridger started criss-crossing the knee high grass mixed with sage brush. With tails flagging high, they soon flushed a nice rooster which took a low, sharp right turn toward the adjacent ravine. His escape plan was crafty as shots rang out high and wide. One errant or lucky shot partially met its mark as he tightened his flight down hill and landed nearly 150 yards away. “We’ll look for him on the way down.” I said, as we all continued west toward the stand of maples. We enjoyed several successes over the hour which partially made us forget about the winged bird. As we made our way down the ravine we didn’t experience any activity. Suddenly, Sheila and Bridger started hunting an area hard off the lower south corner of the ravine. We suddenly remembered, “Oh yea, there’s a winged bird down here.” Paul called out to his boys, "Guns up!" In no time, the dogs flushed the rooster but just at the moment he was elevating off the ground, Bridger wheeled, gathered himself and sprang into the air, mouth wide open and leaping at least two feet high only to catch him cleanly in flight. I was stunned and amazed, asking myself again if he just did what I thought he did. It was then that Paul and I looked at each other, chuckled and wondered why we were carrying our guns around. “Holy Cow” declared one of the boys! “Did you see that?!! !” Bridger trotted over to me, healed and delivered to hand without a second thought. All in a day’s work. I had to choose Bo’s last day as the cancer was inexorably moving forward. I didn’t think I signed on for that job. But then I realized I did; when I remembered him assigning his life to me as his choice. I remember when I sent a young dog across a semi-frozen pond for a downed bird. The ice cracked and buckled under his weight, rolling like waves. He stopped and looked back over his shoulder at me, as he had never been in this situation before. I sent him on. He went, trusting me that all was OK even though I wasn’t sure myself. He retrieved the bird. His courage. I remember him chasing a falling bird; oblivious, eyes focused on the bird; only to be jolted by running into a barbed wire fence at top speed; flung backward as if out of a slingshot; he regrouped and retrieved the bird; ignoring of the gouges in his forelegs and chest, just a waging tail. His pride. I remember a broken wing pheasant gliding out of gun range. It landed in a harvested bean field which had thousands rows of 2” bean stalks sticking up like punji stakes with Bo hot on his heels. The whole group of hunters stopped to watch him as he relentlessly ran up and down that field until he lunged and got the bird and returned it to me. His determination. I remember watching the St. Patrick’s Day Parade in St. Louis where a stranger’s little girl fell in love with him and as the day progressed; petted, then hugged, then lay on the ground next to him, then ended up on top of him. Her parents, Linda, and I watched for signs of irritation from Bo. The fearless hunter was subdued by a 5 year old. His gentleness. I remember Bo retrieving white bass from the live well. Kind of like bobbing for bass. So proud of himself; he next jumped off the boat as Mike was landing another bass and latched on to the fish in the water. Now Mike had to land a fish and a dog. Roaring with laughter, we were too weak to stop the show. His goofiness. I remember an old dog in the desert who, in his golden years, was plagued by two young pups. They would jump and nip at his face in youthful exuberance. He would hold his head higher – just slightly out of range – and give me the beseeching look of: “please take them away”. I would. Never even a growl. His grace. The Vet, a warm and caring person, came to the house with her assistant. He knew. He laid his head, then his life in my lap. As always, he trusted me to know what was best for him. Damn, I loved that dog. In 1968 Newell J. Crookston wrote an article about Old Ephraim for the local newspaper. I was able to get a copy from his relative. In the early 1900s, grizzly bears were a constant problem for ranging sheepherders in the Wasatch mountain range around Cache Valley. 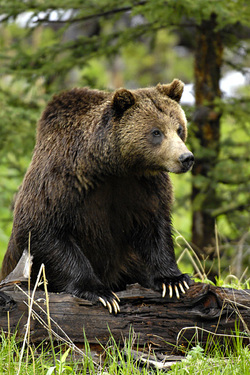 One grizzly in particular, nicknamed “Old Three Toes” because of a missing toe on his foot, had developed quite a reputation by the local herders. His unique foot made his tracks easy to identify. Old Ephraim was big even by grizzly bear standards. He was said to stand 9 feet 11 inches tall and weigh approximately 1,100 pounds. The great bear wandered from Soda Springs, Idaho, as far south as Weber County and finally spent most of his time in Logan Canyon. 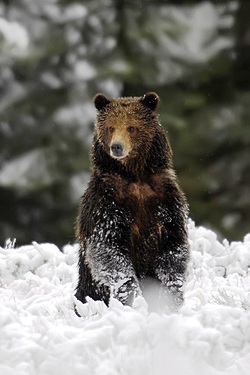 He was named Old Ephraim after a grizzly in California described in a story by P.T. Barnum. Old Ephraim was one of the last great grizzly bears that roamed our valley during the early 1900's and his story is well worth sharing. Pictures below courtesy of Brent Paull at American West Photography. We saw these bears during a couple fall photography trips to Yellowstone National Park. The Polecat - It's milky white, not green! Not far from our house is a long stretch of country canal fed from the Logan River snow run off and natural springs. Prior to dusk, we're often found walking the dogs along the easement road near the foot hills below Flattop mountain. With anxious dogs on lead, we walk east from our house to the canal where we "release the hounds". The dogs enjoy trouncing through the water from bank to bank looking for anything with feathers. Occasionally they'll flush a pheasant, chase a duck or tree a stray cat. On this particular evening, Carson and I walked about a 1/4 mile along the dirt road when suddenly from the opposite side of the canal, River jumped toward us, landed on the near bank and wiggled through the chest high grass. As she emerged, we noticed something firmly in her mouth. "What isssss that?" I muttered to myself. At first glance, it looked like a black rat but then we noticed a white stripe! "There's no way she just retrieved a skunk?!" The drenched and startled young polecat begin spraying feverishly. The gentle mountain breeze spread the hanging ribbons of milky-white haze like smoke to our noses. River's golden grip, gentle yet firm, was undaunted as I saw a hint of pride in her find. Within milliseconds, I was convinced nothing would deter her from releasing the skunk even as her eyes filled with oily tears! "Wow" I thought for a moment as she instinctively gripped the young skunk amidst extreme circumstances. That thought quickly left as Carson and I began running in opposite directions down the dry canal road. "She'll follow Carson" smiling quietly to myself as I felt the mountain air start to clear somewhat. River looked both ways, assessed the situation, then decided "this is a game". My smirk suddenly turned to horror as she quickly closed the distance for a clean delivery attempt into her masters hand! "Ohhhh come on!" I turned, slowed and started yelling NO! NO! NO! Bewildered at my reaction, she turned and started back toward Carson, then another huge plum of misty white toxin filled the air as this youngster had clearly had enough. I kept thinking to myself, how much of that stuff can they possibly produce and how long will this dog try and deliver to hand? After about the 12th "NO!" and the August air thick with natures most potent defense, River finally relented and released the poor, shaken vermin. With tail high in the air and snarling like a badger, to our delight, the bedraggled little rat ran off. Soaked in pungent odor, River started trotting around us again seeking more adventure. Carson and I began a long, watery eyed walk home. There was a brief debate about who would walk River home but that was remedied by my quick hand and capture of Sheila, River's mother who had patiently been a bystander during the melee. On the way back down the foothills, Carson finally broke the silence as a closed mouth helped keep the noxious fumes at bay. 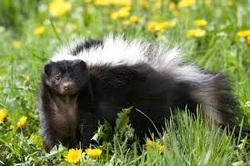 "Dad", "Yes" I replied, Carson continued, "The skunks gas isn't green like it is on the cartoon network." A sudden laugh burst out, followed by a big smile, I composed myself and responded " No son, it looked more milky white to me." When we arrived home "Momma bear" (My dear wife) instantly caught a whiff of the encounter as we made our way into the garage. We were hanging the dog leads on the rack, when a penetrating voice was suddenly heard from behind the door. "Stop right there you two............!" "What can I help you with dear?" In a kind, submissive tone. "Don't play coy with me!" We were then commanded to strip down, discard those awful smelling clothes and shower......twice.